President Kufuor has directed all ministers in his administration to compile their handing-over notes before January 7, 2005, sources close to the presidency have told the paper. The President, at the last Cabinet meeting held on Thursday, December 16, 2004, is reported to have asked all ministers to make their handing-over notes ready by January 6, 2005. The last Cabinet meeting, coming shortly after the re-election of President Kufuor, was attended by all the ministers of state, comprising both cabinet and non-cabinet members. According to the paper's sources, the President thanked the out-going ministers profusely for putting their services at the disposal of mother Ghana. He handed each of them personal 'thank you' letters as a mark of appreciation for their immense contributions to his administration. 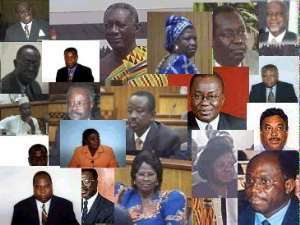 When the paper contacted the Minister for Information, Nana Akomea, he confirmed that the ministers will hold on to positions until January 6, 2005, when the term of the current government ends. There is, however, no word about who will stay and who may be left out in the new Cabinet, which will be formed after the inauguration of the new government on Thursday, January 7, 2005. “The President is keeping everything to his chest”, a source hinted.